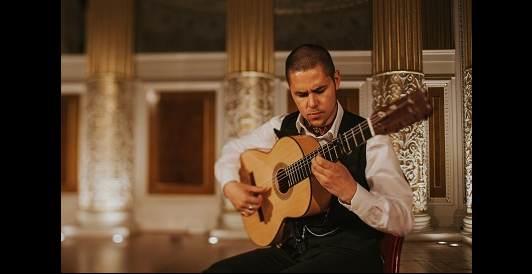 Samuel Moore is the distinguished flamenco concert recitalist who learnt his craft as a one to one student of the internationally acclaimed guitarist Juan Martín. 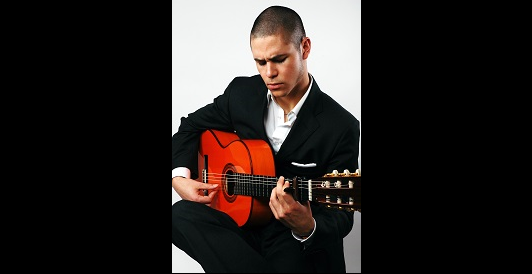 Samuel Moore is the distinguished flamenco concert recitalist who learnt his craft as a one to one student of the internationally acclaimed guitarist Juan Martín. Over the past ten years Samuel has performed in concert halls across the UK, Europe and North America and has also performed and been interviewed on BBC Radio 3, alongside many other national media appearances. His musicianship has been described as: “Fantastic” by BBC Radio 3 and “Masterful” by the legendary jazz guitarist Kenny Burrell. Samuel is also a celebrated composer of original flamenco works and three of his solo compositions were recently featured in the Hollywood film 'Lost in London' directed by Woody Harrelson. In concerts, Samuel is well known for presenting beautifully crafted and diverse solo flamenco guitar sets that bring to life the intoxicating rhythms, colours and sounds of Andalucía, in a burst of glorious improvisation and virtuoso flamenco technique. His concerts are always deeply rooted in the purest flamenco forms and are presented with a finesse and charm that make them accessible, engaging and highly entertaining for both aficionados and those who are new to flamenco.